It is often said that there is truly “nothing new under the sun”—and in the world of classical music, this maxim can seem especially appropriate. The season offerings for any given orchestra or chorus will typically include beloved yet familiar works by a handful of composers, with relatively few artistic surprises. And yet, a neglected or undiscovered composition will occasionally and unexpectedly emerge, to the astonishment and delight of audiences. On the evening of October 21, the Cathedral Choral Society—the 140-voice symphonic chorus in residence at the Washington National Cathedral—offered just such a revelation, with the world premiere of Alexander Kastalsky’s choral requiem, Commemoration for Fallen Brothers. In attendance were several hundred students and scholars, representing American University, George Mason University, Georgetown University, George Washington University, and the University of Maryland (both College Park and Baltimore County). Philanthropic support for the concert—which was titled “Armistice: 1918”—was offered in part by the Carmel Charitable Endowment. 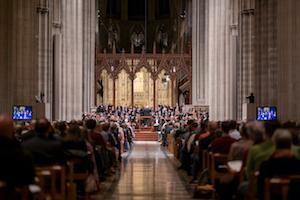 "The National Cathedral served as a beautiful conduit for the entire requiem, as the music almost matches the building in age and impression,” observed A. Drew Smith, an AU graduate student in Literature. Russian composer Alexander Kastalsky (1856-1926) wrote Commemoration for Fallen Brothers to memorialize the Entente lives lost during World War I. While the seventeen-movement requiem was completed in 1917, it was—with the advent of Russia’s revolutions and the subsequent Communist-enforced secularism that banned all performances of sacred music—never performed in its entirety. While most casual historians are aware of the basic Allied wartime roles of Britain, France, and the United States, the participation of Russia, Italy, and Japan—as well as Serbia, Belgium, Portugal, Romania, Greece, Albania, and several other countries—is often relegated to an unfortunate secondary status. Yet Russia’s Eastern Front casualties in the war's first month already numbered in the tens of thousands. The statistics remain shocking, even with the advent of modern warfare and nuclear weapons: the total number of military and civilian casualties in World War I was approximately 40 million, including 20 million deaths and 21 million wounded. During the Battle of the Frontiers—a series of conflicts fought shortly after the outbreak of the war during August and September of 1914, along the eastern frontier of France and in southern Belgium—27,000 troops were killed in a single day. During the Battle of the Somme on July 1, 1916, 12,000 British soldiers were killed in one hour. How to artistically depict such decimation? Ecumenical in nature, Commemoration for Fallen Brothers reflects and borrows from several liturgical music traditions, including Orthodox Russia and Serbia, Roman Catholic France and Italy, and Anglican Britain. Russian, English, Romanian, Serbian, and Indian melodies are woven throughout its movements, which include texts in Italian, Latin, Greek, Russian, English, and French. Maestro Leonard Slatkin—Music Director Laureate of the Detroit Symphony Orchestra—took the podium as guest conductor. The Cathedral Choral Society—the oldest symphonic choral group in Washington, DC—was joined by the voices of the Clarion Choir (whose Artistic Director, Steven Fox, is also the Musical Director of the Cathedral Choral Society), the Kansas City Chorale, and the Chamber Choir of St. Tikhon’s Monastery. Soprano Anna Dennis and bass-baritone Joseph Charles Beutel were featured solo vocal artists, while the Orchestra of St. Luke’s—a New York City chamber orchestra that frequently performs at Carnegie Hall—also appeared. Clergy of numerous religious traditions were in attendance, as well as diplomats representing the World War I Allies. Musically, Kastalsky’s Commemoration for Fallen Brothers traverses a wide range of emotional reactions, intoning expected themes of death, destruction, and mourning—but also voicing hope, healing, and redemption. Jonah Estess—a Ph.D. student in AU’s Department of History—noted that he and his partner "were deeply moved by the performance, by its historical and musical significance. It gave us time to reflect on larger-than-life historical questions; on how music informs memory of the past, and lends perspective to the present." For more information, see the Cathedral Choral Society and the Kastalsky Requiem Project.